CANDLEMASS - EPICUS DOOMICUS METALLICUS RE-ISSUE (CD) | Online Shop | Wizard LTD. 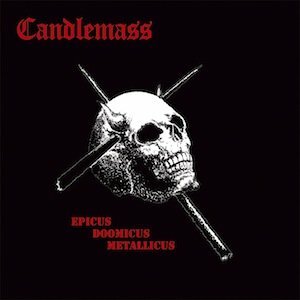 Album: "EPICUS DOOMICUS METALLICUS RE-ISSUE (CD)"
Candlemass was formed by bassist and songwriter Leif Edling in Stockholm, Sweden in 1984, and they are well known for their epic doom metal, having a great influence over a generation of the genre’s subsequent greats - Candlemass themselves taking a large influence from Black Sabbath. &apos;Epicus Doomicus Metallicus&apos; is a true classic. Heavy metal riffs blended with almost neo-classical touches, plus some theatrical elements bringing to mind bands like Mercyful Fate (thought to be another influence). All-in-all, this is considered one of the definitive Doom Metal releases. &apos;Epicus…&apos; was recorded at Thunderload Studios in 1986 and was released later that same year. The vocals were handled by Johan Lдngqvist, before the iconic vocalist Messiah Marcolin became a solid fixture in the band until the early nineties. Candlemass instantly became a great inspiration to countless metal bands upon the album’s release in 1986; a time when thrash metal, not doom, was fast becoming the dominant style in both Europe and the US. Bands such as Paradise Lost & My Dying Bride to this day rate the album among their favourite albums ever. This edition of ’Epicus...’ includes a special commentary disc with founding member Leif Edling, recorded early 2011, discussing his memories & inspirations of the writing & recording process whilst the tracks play. The booklet also contains liner notes from the band, including an introduction from Aaron Stainthorpe of My Dying Bride.